Lime, trass, mortar, concrete and artificial stones at the turn of the 19th century: Premises for the development of concrete. The state-of-the-art knowledge about lime, between alchemical heritage and scientific achievements. Cement, the practices of producing hydraulic mortar and the importance of trass. Rudimental traces of concrete in foundations, between local experiments and references to antiquity. Hollow masonry-faced walls filled with concrete. French concrete foundations in Rhineland. The ambition to produce mortar-based artificial stone. New knowledge about hydraulic lime, cement and mortar: The Theorie des besten Mörtels by John. A new awareness about hydraulic lime and mortar. Cement from England and policies for the Gewerbeförderung. Artificial stones by Sachs and moulded statues by De la Rivallière-Preignac von Frauendorf. Roman cement applications and hydraulic lime manufacturing. Concrete hydraulic foundations: trass versus – hydraulic lime. The realization of John’s theory in Fuch’s studies – on lime and mortar. Concrete foundations in technical literature. Hydraulic lime and cement manufacturing: The Bavarian hydraulic lime, a mineralischer Schatz. Cement manufacturing in Northwest and central Germany, from Hamburg to Kassel. Further production of hydraulic lime and the persistent fascination with English Roman cement in Prussia. Mortar, plaster and concrete, experimental uses of Kassel and Hamelin cement, and the attempts to build continuous masonry elements. Concrete foundations, walls, artificial stones: Concrete foundations in regions along the Rhine, the persisting use of trass. Concrete foundations in Bavaria and Pomerania, the exploitation of local hydraulic lime. Lean conglomerates for rural buildings and the development of Kalksand. Concrete and cement in Hamburg, between Dutch, French and English influences. Moulded cement-based artificial stones and mortar tiles. Concrete fillings for bridge decks, and to restore masonry cracks. The concrete foundations of the piers for the railway bridges in Dirschau and Marienburg, the development of local artificial cement by Lentze. Further studies about materials used to produce hydraulic mortar and concrete. Portland cement and concrete construction, from foundations to roofs: Portland cement and its prevalent use in binding brickwork. The manufacturing of Portland cement by Bleibtreu. The acknowledgment of the monolithic behaviour – of concrete and the further spread of concrete foundations. Lean conglomerate as a German kind of concrete – for above-ground constructions. The manufacturing of Cementwaaren. Improvements to scaffoldings and sheet pilings – for foundations underwater, the building of the bridge over the Rhine in Koblenz. Sinking wells, sinking caissons and pneumatic caissons. Concrete for above-ground constructions. 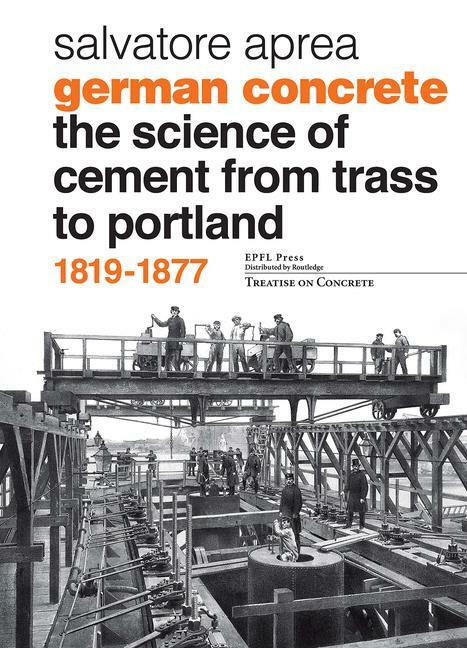 Further studies about Portland cement and the regulation of its main physical features. Salvatore Aprea is an architect and architectural historian. He received his doctoral degree in construction history at Ecole Polytechnique Fédérale in Lausanne, where he is a scientist and curator of the Archives de la construction moderne. He has published several essays, books and periodicals about the history of concrete.